A trip to California’s wine country is filled with excitement, anticipation of new vintages, beautiful scenery and a host of friendly people who love talking about their product and the wine industry in general. A must on your bucket list is the Jordan Estate tour and tasting experience. On this one-of-a-kind journey through the breathtaking estate (encompassing nearly 1,200 acres), we traveled by car and foot, relishing in a farm to table, wine and food tasting odyssey. 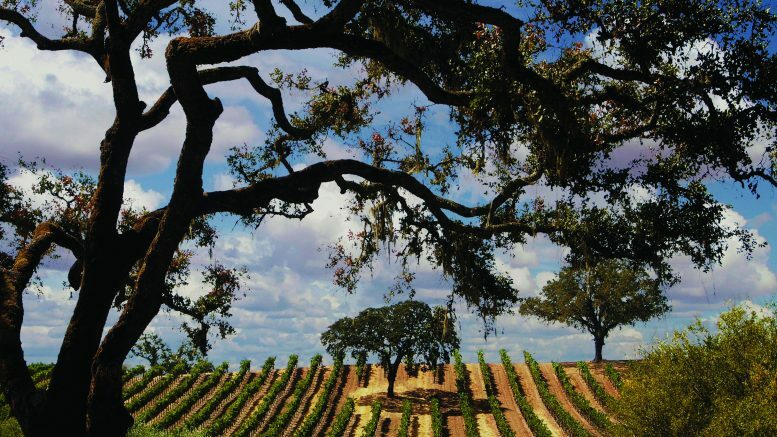 The tour’s duration is an incredible three hours of wine and food pairings, including fresh produce from the Jordan garden, Chardonnay pairings at Jordan Lake and a seated, Cabernet Sauvignon pairing at the highest point of the estate—with 360-degree views of three different wine valleys. Executive Chef Todd Knoll utilizes the tantalizing freshness of Jordan’s garden as well as local farms to produce hors d’oeuvres that complement Jordan’s wine and its extra virgin olive oil. In addition to the estate tour, there is an offering in the Jordan private library and another through their chateau. Advance reservations are required. We had the pleasure of staying in one of Jordan’s spectacular suites that is truly fit for royalty. In fact, if we didn’t know better, we’d have thought we were staying at a castle tucked deep within the French countryside. The continental breakfast, brought to your room at 9 a.m. is a veritable feast of fresh fruits from the Jordan garden (figs, raspberries, strawberries) with homemade yogurt, muffins and by far, the absolute best croissants I have ever tasted. Remember that for every dollar spent, guests earn points that are redeemable for rewards such as accommodations in these same, beautiful suites. Jordan is also a certified green winery, taking into account the surrounding habitat of animals and indigenous vegetation, using solar energy and recycling water to preserve the sustainability of its environment. Before you depart, make a stop at the Jordan gift shop where you can purchase a variety of items, but most importantly, Jordan wine! Without a doubt, the Dry Creek Kitchen is the top fine dining establishment in the town of Healdsburg. It exudes an airy, contemporary flair, yet has a hint of old Hollywood where you might envision Clark Gable and Carole Lombard dining casually in a corner booth. In other words, the environs are at once pleasing to the eye, and pleasure to your palate comes next! And, in keeping with the Jordan theme, the cuisine is paired with three different Jordan wines. Executive Chef Dustin Valette is a master, presenting us with a juicy Hawaiian Ahi Crudo, a savory Scallop En Croute (a specialty of the house), a tantalizing pasta crusted Petrale sole and finishing with a hearty lamb T-bone with Merguez sausage and red corn polenta. Pastry chef Andrew Di Clementi created a delicious chocolate peanut butter bar leaving our palates drenched in delectable aftertastes. Service is spot on and with GM Drew Munro keeping a pleasant pace in tandem with sommelier Courtney Humiston, the evening went off without a hitch!Bravo! The drive from Healdsburg to Mendocino is a pleasant one, dotted with wineries tucked perfectly within scenic vistas and rolling hills. Along the way we stopped at Edmeades, which specializes in tasty Zinfandels from the Anderson Valley and is well worth the visit. After driving the winding roads of Highway 101, you are rewarded handsomely with the quaint and charming town of Mendocino. A sleepy little place at first sight, yet as you embark further, you realize there is an inner life and spirit—not only in regards to the town, but of the people that inhabit it, both locals and tourists alike. From art galleries to specialty clothing stores to great restaurants, there is something for everyone and every age. Check out the Trillium Café and Inn for great lunches, gourmet dinners and great desserts; for lunch we had delicious fish tacos and a tasty pulled pork sandwich. You can also stay at the Trillium overnight if you want accommodations right in the heart of Mendocino. The Inn at Cobbler’s Walk bed and breakfast is the sister property of the Glendeven Inn, which is situated directly across the street. Guests of this comfy B&B can share in Glendeven’s amenities, which include a wonderful gift shop, a café where you can buy anything from sandwiches and snacks to wine and beverages, a host of llamas that the kids will enjoy petting, and some very attractive chickens that can be fed from your very own bag of chicken feed, supplied to you by the management. 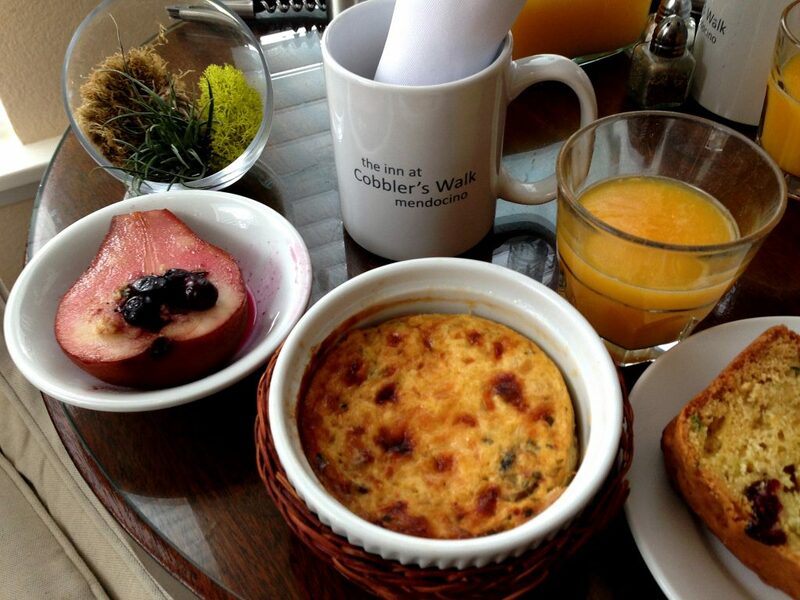 At 9 a.m. the most scrumptious of breakfast baskets is delivered to your room, consisting of freshly squeezed OJ, a melt-in-your-mouth green chile frittata, fresh fruit, coffee, tea and the best tasting corn muffin ever. Spectacular! We stayed in the Van Damme Room, which was nicely appointed with a cozy fireplace, flat screen TV and a quiet terrace which overlooked colorful gardens and a massage cabin where you can book a soothing session if you are so inclined. In the main building, the Cobbler’s Walk offers unlimited tea, coffee and homemade cookies 24/7. In addition, it houses Bistro 150, a farm to table fine dining offering where all ingredients are sourced within 150 miles. The experience is intimate as attendees share one large table and partake in pre-selected entrees such as sautéed garden zucchini topped with local cherry tomatoes, a kale Caesar salad, entrée choices of either pork tenderloin, crispy salmon filet or broccoli and ricotta cannelloni. And for dessert, a garden roasted rhubarb with pecan crumble and meyer lemon ice cream. Wow! Go for it! Bistro 150 dinners are held promptly at 6:30 p.m. on Tuesdays, Thursdays and Saturdays from March to October and from November to February on Thursdays and Saturdays only. 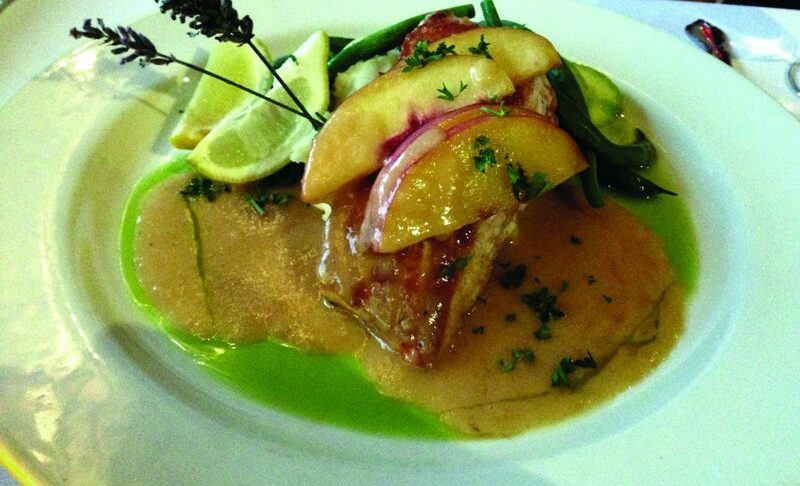 The dinners are also open to non-guests of the B&B and reservations and pre-selected entrees are required: 707-937-0083. Tony and Lisa Geer have run the Ledford House Restaurant for some 25 years at this location. That amazing longevity can only mean one thing; extraordinary quality, artful presentation and superb taste. In addition to taste, the restaurant is filled with charm and style that exudes “French bistro.” The space is long and rectangular, divided with pleasing feng shui into two separate rooms. We dined at a table in the first room overlooking the grand Pacific. The other room is quite dazzling, with multi-colored rows of fabric suspended from the ceiling that curl upwards creating a carousel effect, under which is a duo of live, entertaining music. Our meal started with a hearty French lentil soup, followed by an amazing roast beet salad with goat cheese, hazelnuts and arugula. Next came juicy entrees of duck breast in a wild blackberry sauce, and Alaskan salmon in a creamy peach glaze that was out of this world. For dessert, a sinful chocolate pudding cake with vanilla gelato, whipped cream and nuts and a heavenly plum tart. Tony is hands on, serving up dishes and conversation while Lisa is in the kitchen performing her magic. Don’t miss it! The Jordan Winery – 800-654.1213 or 707-431-5250, 1474 Alexander Valley Rd., Healdsburg, CA, 95448. Tours are hosted Thursday through Monday until Nov. 10. Other things to do: Camping at Van Damme State Park, Hike & Bike at Russian Gulch State Park, Headlands State Park for the kids, Point Cabrillo Lighthouse, The Kelley and Ford House Museums, Mendocino Theatre Company, kayaking and canoeing. Richard Atkins is a travel writer, playwright and pianist and can be reached at seaofclouds@att.net. All photos by Richard Atkins.